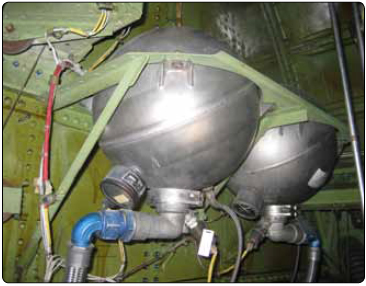 Older aircraft with reciprocating engines used CO2 as an extinguishing agent, but all newer aircraft designs with turbine engines use Halon or equivalent extinguishing agent, such as halocarbon clean agents. 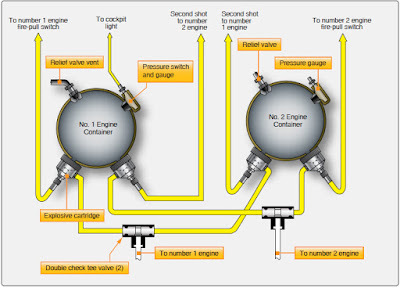 The fixed fire extinguisher systems used in most engine fire and cargo compartment fire protection systems are designed to dilute the atmosphere with an inert agent that does not support combustion. Many systems use perforated tubing or discharge nozzles to distribute the extinguishing agent. High rate of discharge (HRD) systems use open-end tubes to deliver a quantity of extinguishing agent in 1 to 2 seconds. The most common extinguishing agent still used today is Halon 1301 because of its effective firefighting capability and relatively low toxicity (UL classification Group 6). Noncorrosive Halon 1301 does not affect the material it contacts and requires no cleanup when discharged. Halon 1301 is the current extinguishing agent for commercial aircraft but a replacement is under development. Halon 1301 cannot be produced anymore because it depletes the ozone layer. Halon 1301 will be used until a suitable replacement is developed. 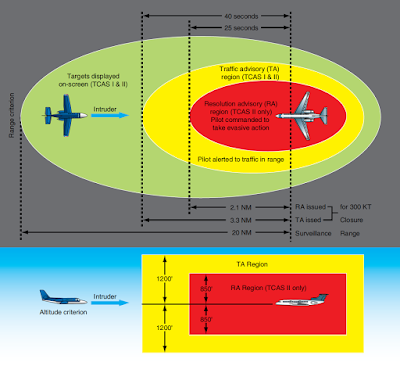 Some military aircraft use HCL-125 and the Federal Aviation Administration (FAA) is testing HCL-125 for use in commercial aircraft. Figure 3. Discharge valve (left) and cartridge, or squib (right). 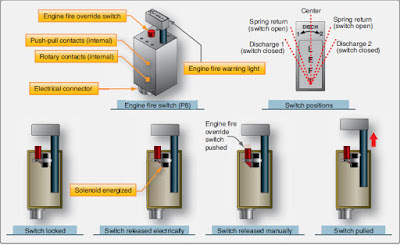 A wide range of diagnostics is utilized to verify the fire extinguisher agent charge status. A simple visual indication gauge is available, typically a helical bourdon-type indicator that is vibration resistant. [Figure 2] A combination gauge switch visually indicates actual container pressure and also provides an electrical signal if container pressure is lost, precluding the need for discharge indicators. A ground checkable diaphragm-type low-pressure switch is commonly used on hermetically sealed containers. The Kidde system has a temperature compensated pressure switch that tracks the container pressure variations with temperatures by using a hermetically sealed reference chamber. 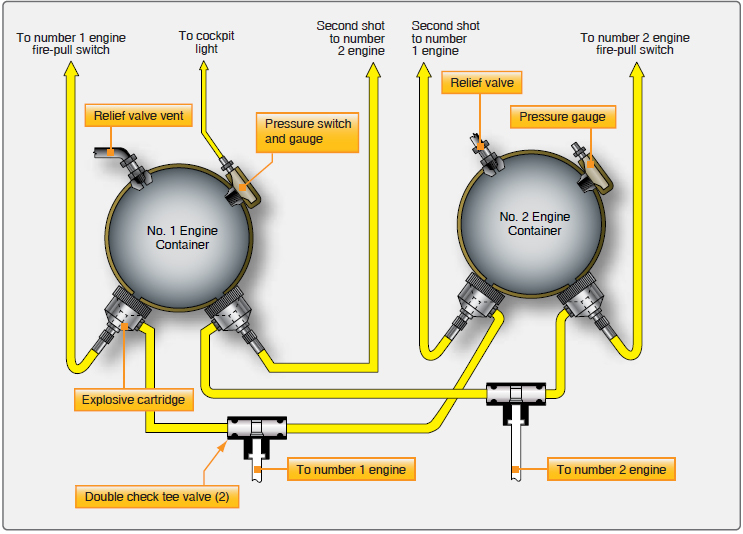 Two-way check valves are required in a two-shot system to prevent the extinguisher agent from a reserve container from backing up into the previous emptied main container. Valves are supplied with either MS-33514 or MS-33656 fitting configurations. The thermal discharge indicator is connected to the fire container relief fitting and ejects a red disk to show when container contents have dumped overboard due to excessive heat. The agent discharges through the opening left when the disk blows out. This gives the flight and maintenance crews an indication that the fire extinguisher container needs to be replaced before next flight. 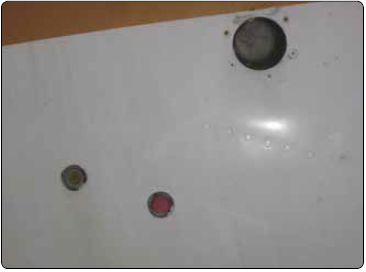 If the flight crew activates the fire extinguisher system, a yellow disk is ejected from the skin of the aircraft fuselage. This is an indication for the maintenance crew that the fire extinguishing system was activated by the flight crew, and the fire extinguishing container needs to be replaced before next flight.